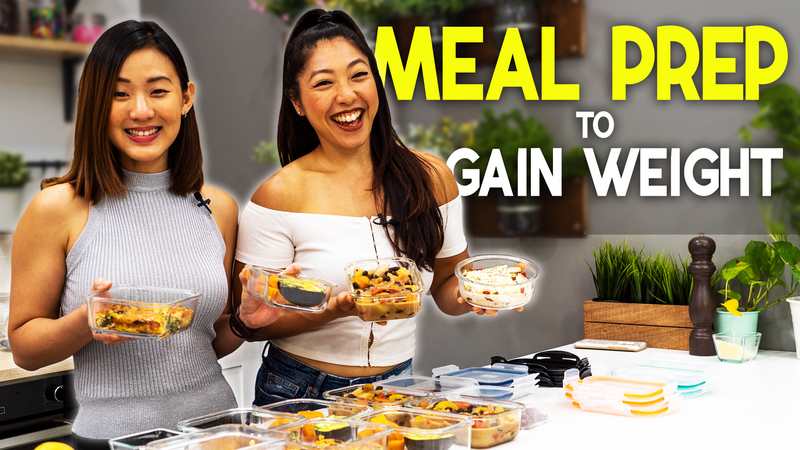 What is a typical healthy oriental meal plan? When it comes to cooking and eating, traditionally, Asians practice keeping their meals simple, balanced and moderate. The basic principle is consuming a diet of simple whole grains, with cooked vegetables and a little bit of everything else. Too much or too little of any one thing is not good. Asian’s diet is mostly gluten and diary free. The emphasize is to use natural real ingredients to cook. So I’ll be sharing with some of my easy and simple favourite dishes, which are also widely consume for breakfast, lunch and dinner in East / Southeast Asia. **For vegetarians, you may omit this. *For vegetarians, you may omit this. 1) Combine fish, soy sauce and sesame oil in a bowl. Mix well and allow it to marinade for 20 minutes. 2) Grind the rice in a food processor. This will speed up the cooking process and more importantly you’ll have a really soft and smooth congee. 3) In a large pot, combine rice and 5 cups of water. Set it on the stove to boil. 4) When water comes to a boil, open the lid slightly and allow it to simmer on medium heat for about 10 – 15 minutes. Stir frequently. 5) If congee gets too thick at any point, add in ½ cup of water to dilute it. 6) After 10 minutes or once congee is really soft, add in the marinated fish and a pinch of salt. Continue stirring until all the ingredients are mixed well. 7) Increase to high heat and allow all the ingredients to cook for another 3 – 5 minutes. 8) Finally, stir in the fish sauce. Remove from heat and serve warm. 9) Top it up with spring onions, ginger slices, parsley and a few drops of sesame oil and soy sauce. If you like a hint of spice, you may add white pepper powder too. This large bowl of fish congee is easy to digest and will provide you with enough energy to start your day. Yes, there are a lot of different opinions on brown rice vs white rice. Although, white rice isn’t as nutrient-dense in comparison to brown rice, there still is nutritional value in white rice – it contains protein, carbs, iron and some B vitamins. So just know that, consuming white rice isn’t bad for you and if eaten in moderation, it can make part of a healthy diet. And because white rice is lower in fiber, it is easy to digest and can be a better choice for those with digestive issues. This is also why we love to have congee for breakfast, because this bowl of hearty meal will keep you satisfied and it’s easy for your body to break it down too. 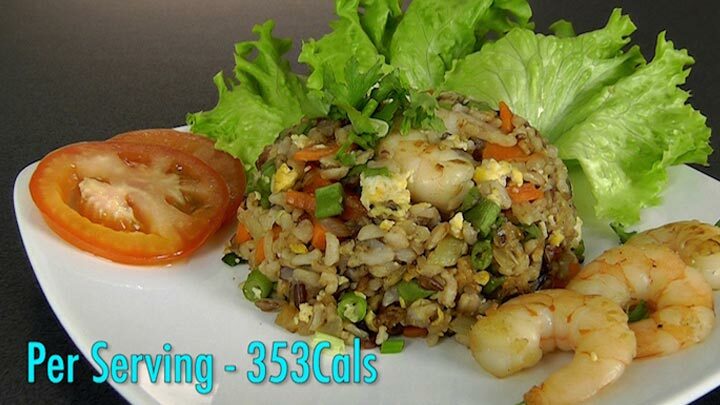 As for lunch, I’ll be sharing with you a popular chinese takeaway dish – egg fried rice. Most of the time, egg fried rice prepped by restaurants tend to be unhealthy as they can be too ‘generous’ with the amount oil used. For my recipe, we want to limit the amount of oil, and just keep the ingredient simple and fresh. **Option, any other protein of your choice. 1) Heat ½ a tablespoon of olive oil over medium-high heat. 2) Add garlic and toss quickly for about 10 seconds. Then add in onions and lightly stir-fry until golden brown and fragrant. 3) Add the shrimps and sauté for 1 – 2 minutes until shrimps are slightly pink. Then stir in the carrots and long beans. Continue to lightly fry all the ingredients together for about 3 – 4 minutes until vegetables are slightly soft and the shrimps are pink and cooked through. 4) Next stir in the rice, soy sauce and mix well. 5) Then spread the rice mixture to the corner of the pan creating a small hole in the centre. 6) Add the remaing ½ a tablespoon of olive oil in the centre of the pan. Add the egg and scramble very quickly for about 10 seconds. When the egg is still a bit runny, combine with the rice mixture. Mix well. 7) Finally, stir in the spring onions and season with salt and pepper. 8) Remove from heat and serve! 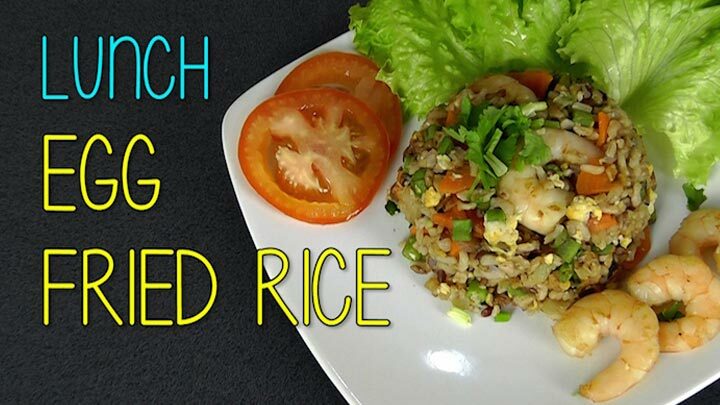 Because it’s so easy and quick to cook, egg fried rice makes a great lunch-to-go as you can prep it in the morning or the day before and pack it with you to work or school. 1) Bring a pot of water to boil. 2) Cook soba noodles for 5 minutes or according to instruction. 3) Once noodles are cooked, drain and rinse with cold water. Divide the noodles evenly into 2 bowls. Mix ¼ teaspoon of sesame oil into each bowl and set aside. 4) Next, bring a pot of water to boil and cook the chicken. Once chicken is cooked, remove from boiling water and set aside to cool down. 5) In the meantime, we want to make the broth. Coat a large pot with olive oil over medium-high heat. 6) Add crushed garlic and onions. Cook until fragrant and onion is slightly brown. 7) Then add 3 cups of chicken stocks and bring to a boil for about 5 minutes. 8) Once broth starts to boil, reduce to medium-high heat. Add in green leafy vegetables and goji berries. 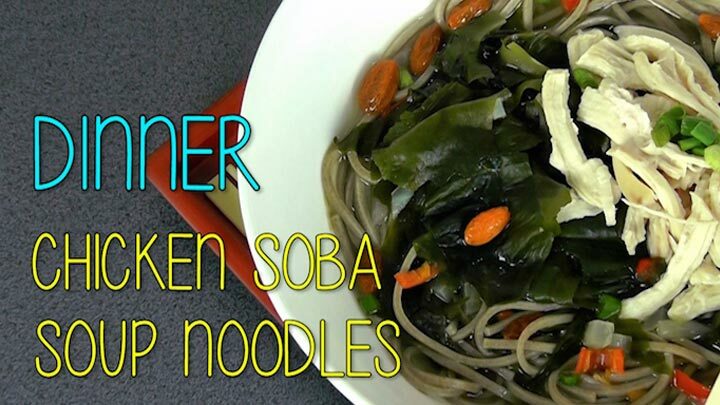 For this recipe, I’m using seaweed. Allow the ingredients to cook for another 2-3 minutes until vegetables have soften. 9) Once chicken has cool down, hand shred it into small piece. 10) Pour broth evenly onto the noodles and top each bowl with shredded chicken, spring onions and fresh chopped chillies. 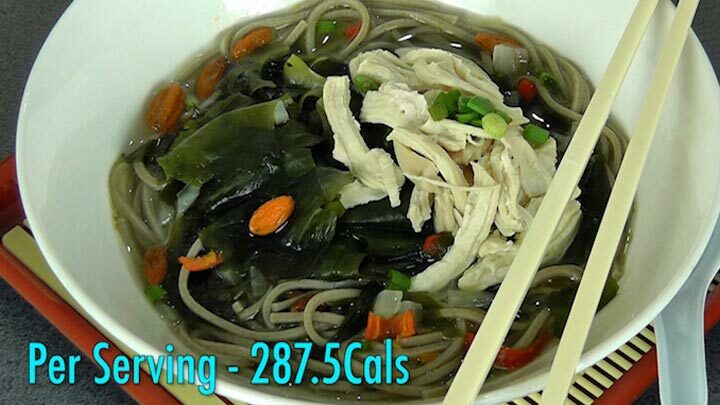 Both soba noodles and seaweed are known to promote healthy bowel movements and reduce fat accumulation. The high fiber content in them also helps you to feel full faster and prevents overeating. They are also gluten free. Goji berries are very high in antioxidant. Consuming goji berries on a regular basis can help with anti-ageing, to control blood sugar and appetite, which helps towards weight loss. 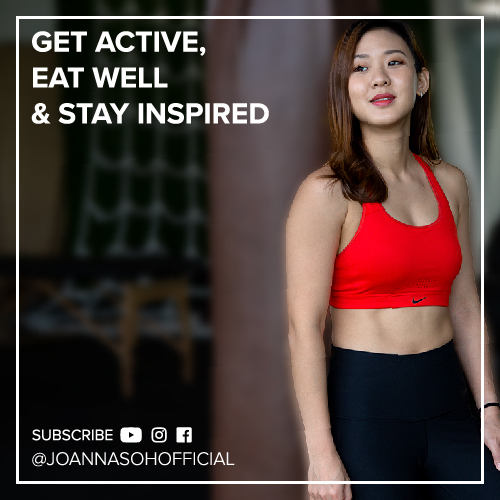 Watch my video here, to know more about the benefits of this awesome superfood. As for your primary beverage, it should be water, secondly green tea. Everything else, should be occasional. In my next video, I’ll be sharing 2 of my favourite Oriental snacks to complete this meal plan. Be sure to watch it. The foundation to healthy cooking is to use real ingredients because calories ingested from natural sources will give you a more energy throughout the day, satisfy your hunger, reduce cravings and help to eliminate waste efficiently. Keep it simple, balanced and moderate.